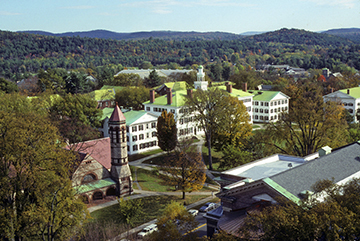 Survey says Dartmouth delivers best college value in N.H.
Dartmouth College may have the highest tuition in the state, but it also delivers the highest value, according to a new college ranking based on 2013 data compiled by SmartAsset, a financial data and technology company. But on average, according to SmartAsset, New Hampshire colleges offer less value than all but a handful of other states. Dartmouth, with a sticker price of over $45,000 a year, earned a 75.48 rating on the SmartAsset College Educational Affordability Index. But it bests seven other colleges in the state that were included in the ranking on three of four factors: scholarships and grants ($37,160), starting salary for graduates ($55,000) and student retention rate (98 percent). As for the fifth category, Dartmouth’s room and board is higher than most colleges, at $17,829, but it actually was slightly lower than Rivier University, which – with its 22.12 rating – was last among the Granite State colleges listed. Keene State was the runner-up to Dartmouth with a 57.75 ranking. Its annual tuition of $12,776 was among the lowest, as was its living expense, but so was financial aid ($6,266) and starting salary of graduates ($39,300) – the only one that didn’t surpass $40,000. UNH, with a rating of 54.10 was ranked third. St. Anselm College ranked forth (53.2), Plymouth State fifth (52.57), Franklin Pierce sixth (33.65) and Southern New Hampshire University seventh (29.19). Other schools were not ranked because the company did not have the data required, a spokesperson told NHBR. Nationally, New Hampshire colleges delivered the lowest value, according to SmartAsset. Nationally, Dartmouth ranked 78th, for instance, far behind the Massachusetts Institute of Technology, which was about $3,000 a year cheaper than Dartmouth but whose graduates earn an average starting salary of $68,800. The University of Michigan in Ann Arbor ranked first in the nation, with a starting salary of $54,000 and a sticker price just shy of $13,000 – an amount totally covered by the average scholarship of slightly less than $14,000. Keene State ranked 363rd nationally, and UNH was 460th. SNHU and Rivier ranked 831st and 856th, respectively, out of 877 U.S. schools.